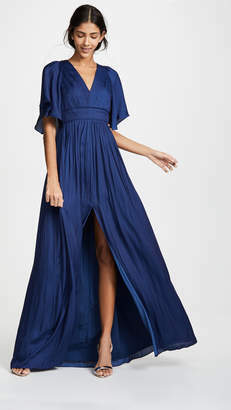 Sleek fitted bodice gown enhanced with waist-defining ruching flows to a draped skirt with contrast lining. 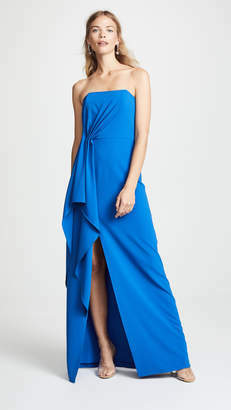 High neck Sleeveless Concealed back zip Ruching details Draped skirt Leg slit with contrast lining Polyester crepe de chine lining Polyester/spandex Dry clean Imported SIZE& FIT A-line silhouette About 61.75" from shoulder to hem Model shown is 5'10" (177cm) wearing US size 4. Dress Collectio - Contemporary Evening. Halston Heritage. Color: Black Chalk. Size: 0.